We'd like to wish all our supporters a very Happy New Year! As we move into the new year, we've taken a look back at some of the successes LCC, together with our members and supporters have achieved during 2014. With your support, we hope to see more of this in 2015! In January, we helped lots of people keep up their New Year resolutions by developing a cycle loan scheme in the borough of Lewisham. At the end of the scheme approximately 90% of participants either bought a bike or said they intended to – a great success, and one which meant the scheme was rolled out in Lambeth and Enfield later in the year. In February, the Mayor responded to our request for better junctions and committed to improving 33 junctions in London. We’re now starting to see the results of that promise, with consultations recently taking place or in progress on Archway, Old Street and Elephant and Castle. In March, we won a London Transport Award for our ‘Love London Go Dutch’ campaign, in the ‘Excellence in travel information and marketing’ category. This campaign was supported by 42,000 people, and the associated protest ride by 10,000 cyclists. In April, ahead of the local council elections in May, we called on every candidate to support safer cycling in their area and asked them to back a specific local improvement identified by our local groups. 50% of candidates agreed to do this, which translated to 47% of Councillors who were elected. That's a huge, 862 Councillors who support Space for Cycling! In June, Transport for London agreed to substitute the offensive ‘Cyclists stay back’ stickers on the back of lorries and buses with new, more cyclist-friendly ones, after objections from the LCC and other cycling and transport campaigning allies. In July, we saw the first signs of real space for cycling as Transport for London launched a consultation on the first section of Cycle Superhighway 5, linking Oval to Belgravia. While the plans are a long way from perfect, the fully segregated lanes on the plans made them the most ambitious cycle infrastructure plans yet seen in London. In September, we welcomed plans for improving Cycle Superhighway 2 between Aldgate and Bow roundabout – a much needed upgrade on a route which currently offers no protection for cyclists, and the site of several LCC protest rides. In November, consultations on the North-South and East-West cycle superhighways ended: 80% of the responses were positive, and 6,300 of the 20,000 responses were sent through the LCC website. While we’re waiting to hear from TfL following the consultation, the level of support shown for the plans meant we could make a strong case for why the superhighways should be implemented without delay. And in December, the Hounslow Cycling Campaign claimed a Space for Cycling success: after 35% of their councillors supported our campaign in early 2014, our local campaigners have convinced their council to consult on protected space and slower speeds on a busy main road in the borough. Thanks again for all your support in the past year. Together we are making a real contribution towards cycling in London. We hope you'll be able to help us with our campaigning efforts in 2015! 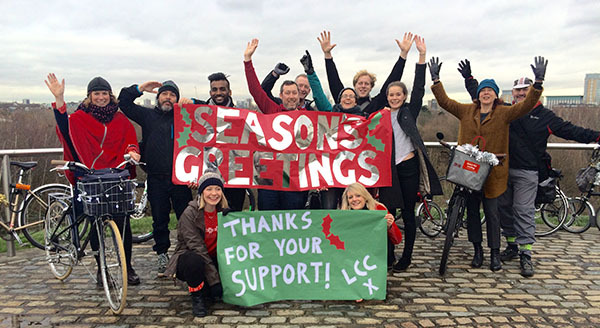 Best wishes from the LCC team!